V4 Reversible - Fits stamped receiver AK pistols, such as DRACO. Note: Does NOT fit Yugo PAP pistols..
V5/AMD - Ambidextrous. Fits AMD-65 rifles.Made in USA..
V5/MU - Ambidextrous. 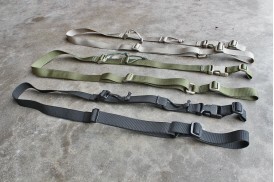 Fits milled and Yugo underfolders and Yugo PAP pistols.Made in USA..
Just like the AK, these rifle slings are ultra durable. Unlike the AK, these were made in the USA.Fe..